For those of you who followed my blogs this past year on my friends Pat and Kim Weber in Florida, who adopted the Chinese, special-needs girl by a miracle of God, I wanted to let you know that Kim emailed me and Hadassah has bonded very well with the family and is doing just great! Hadassah was born with a defect to her hand. Kim used to teach in a Catholic elementary school, and they now homeschool their children. Kim is an amazing teacher, and her three children excel in their studies. I have no doubt that Hadassah will be above average, too, with Kim as her mommy and teacher! 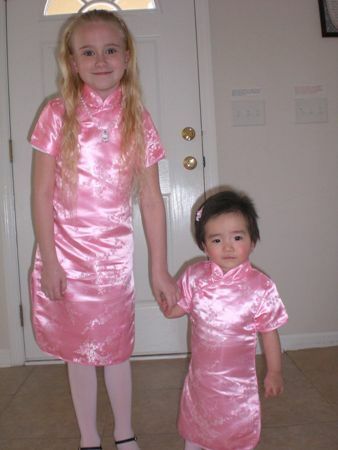 When I flew to Florida to babysit their children while they flew to China, I watched Kim teach a classroom of young girls the “American Girls” history studies at the homeschool co-op the day before they left for China. The girls loved it, and I was so impressed with Kim’s anointed teaching. 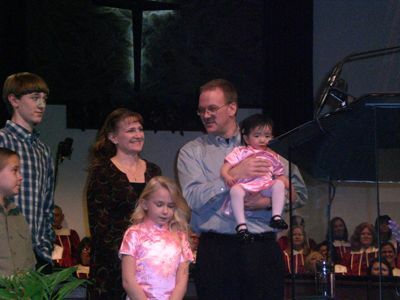 Pat and Kim dedicated her to Jesus at church one recent Sunday. Their pastor Cecil had read the Florida, local newspaper article story that ran on Pat and Kim adopting Hadassah, and he asked Kim to give a brief, impromptu testimony. Afterwards the people clapped and Hadassah clapped, too, and raised her hand. Kim said, “She was giving glory to Jesus! It was so cute.” Many people came up to Kim afterward, talking to her about their adopting her. Isn’t this just a beautiful story? My eyes fill with tears as I think about Hadassah pointing up and saying “Jesus.” God set Pat, Kim, and Hadassah apart from the beginning of time, to bring them together in His perfect timing, so she would learn about Jesus and become His in this devout Christian home. Thank you all for praying for them, and please continue to pray for Pat and Kim as they still have to pay off the loan for her adoption, plus the medical bills they are incurring with her therapy. If you feel led to donate to them, please send a check or money order to Pat or Kim Weber, 1484 Dunns Lake Drive, Jacksonville, FL, 32218. I am just so excited over how quickly she bonded with them – I knew she would! And so happy to hear how well she is doing. The family loves her so much. I can’t wait to meet her one day!